I have started the series of posts to explore different cities within the one-day time span. Life is short so use your time wisely and explore as much as you can. With this series of posts, I have already shared “one day in twin cities Minneapolis“. 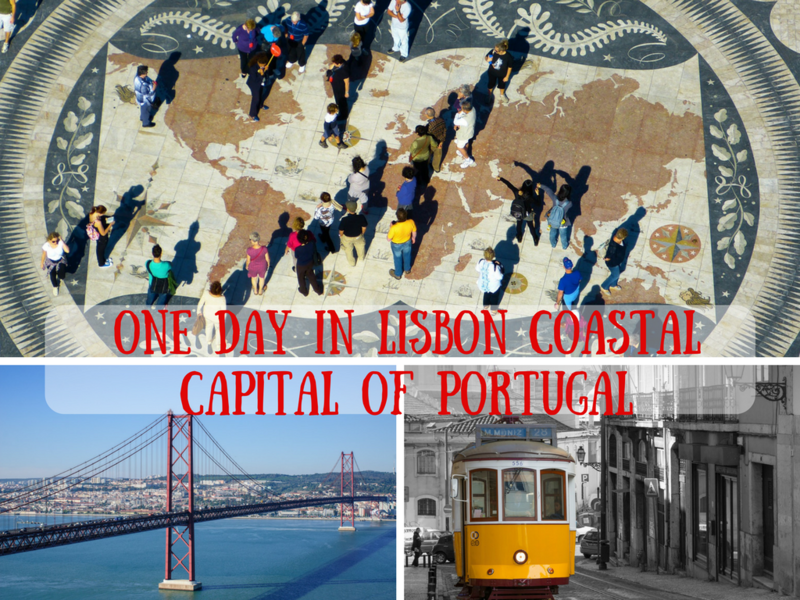 Today I am happy to share the guest post “One day in Lisbon Coastal capital of Portugal” by Danni, a beautiful travel blogger, and explorer. Taking in the sights of Lisbon soon? No matter the length of the trip, here are some hidden gems you’ll love to include in your visit, from someone who lived there. I’m not Portuguese, but I was an expat in Portugal in 2014 and adored every minute of it. Living and working in Lisbon for 6 months was glorious, though admittedly pretty damp- I didn’t see as much sun as I’d hoped! But it did give me plenty of time to suss out the best activities, and where best to spend my time. So without further ado, here are the picks of a half-local, half-foreigner with a taste for good nibbles and gorgeous views, from this city of 7 hills. A lovely way to start your day is by walking up to the 25 de Abril bridge before the heat sets in and swarming with the tourists around the Christo Rei statue. The part with 5 euros you can take the express elevator to the base of the statue and get even more spectacular views of your surroundings. As soon as that’s finished, the next highlight is the Free Street Art Tour of the city. I stumbled across this guided tour on TripAdvisor and wasn’t too hopeful since I had already strolled around Lisbon a fair bit. Luckily, it blew me away! Véro, your tour guide, leads you to corners you would never have found solo and she is a passionate artist who has spent time with the hidden players in Lisbon’s street art scene. She brings the whole experience to life and finds incredible pieces to show you. The street art in Lisbon is very edgy, often commenting on apt issues and poking fun at the local culture. You won’t want to miss it. Although the tour is officially free, you’ll definitely want to tip the amazing guide a few euros or a beer at the end. You’ll now be ready to fall in love with Lisbon and eat some tasty lunch. On your way to try some of Lisbon’s famous ‘Bacalhau’ (cod) design your own tour between the essential points. The trams in Lisbon are an experience in themselves, beautifully restored and elegantly streaming up the immense hills. Be warned, however, that they are also legendary for pickpocketing. My favorite and the most priced ride is Tram 28. Ride this with a friend and watch each other’s pockets- that way you will be fine. Shoot via the trams between the Miradouros (lookout points) of the city which will be on your map (or Google Maps). These are usually at an enclave with an amazing view and a tempting outdoor cafe and perhaps a mural showing the city’s history in painted tiles. Some are so popular they attract decent crowds around peak times such as sunset. I spent an entire day surfing between these for the cost of a day’s tram pass, and felt I knew the real Lisbon from every angle. For a heady evening entertainment make your way to the Museu do Fado for a taste of true Portuguese culture, and immerse yourself in exquisite music. This gem charts the history of fado, including the instruments, musicians and abundant samplings for your ears. It’s hard to really understand fado until you’ve been to this museum and then spent a night in a fado venue sipping wine and hearing it in its native habitat. Talk to locals and you will find an array of fado afficionados. When the heavens open, as they often do in Lisbon’s spring, you can’t beat a day in the cozy calm of a museum. I have visited dozens, but the cream of the crop were definitely two that don’t get enough tourist attention. The Museu da Marioneta is charming and surreal, inside which glowing lights lead you through incredible dolls and figurines, past theatrical history and all the way up the modern filmmaking and staging with puppets. It’s interactive too and you won’t be able to resist getting involved and setting up your own scene. If you are short of time, Belem is a place to concentrate your precious hours. It is a district of Lisbon that has so much to offer and you’re hard pushed to squeeze it all in. If you can try Belem on a week day as the weekends attract a lot of tourists. As soon as you jump off the tram, you’ll want to stroll the estuary front. Don’t miss the amazing mosaic of Portuguese exploration around the globe as you enter. The planetarium and maritime museum dominate here- Belem to me is a homage to Lisbon’s naval past. It’s an easy walk to the Torre de Belem on the coast to sit on canons and act out the battles of the past. Don’t forget to have intensely fresh seafood at any of the restaurants that line the estuary (bacalhau com natas or cod with cream is the traditional thing to order). After that, you can spoil yourself with the Pasteis de Belem- something close to a warm custard tart but more accurately a local creation that melts in your mouth. In the central square, you’ll find the Pasteis de Belem restaurant which bakes them from a traditional monk recipe and specializes in nothing but. It’s hard to find a seat if you come at the most popular times on weekends! Enjoy your visit and be sure to take these tips along with you! Happy travels! I have always wanted to go to Portugal. Your info makes me want to go even more. Wow this looks so much fun and super informative. Was the flight pretty long or decently priced? Thanks for sharing! What a beautiful colorful place! Looks like it has a lot of character about it! I had no idea Lisbon was such a beautiful city. I would love to visit! I would love to check out the museums – that is an activity that our family frequently participates in and every museum is so different from every other. It is all quite exciting. I love visiting the museums when I visit a new place. Lisbon looks so fascinating! Your photos are so gorgeous. I haven’t been to Portugal. Your post makes me want to plan a trip.